Hanoi (VNA) – A ceremony was held in Hanoi on April 10 to launch a project on educational cooperation for sustainable changes in Vietnam’s deltas, attracting the participation of the project’s Vietnamese and Dutch partners. Vietnam as a country heavily suffers from the impact of climate change, with its major Red River and Mekong Deltas facing various water resource challenges, like the management of resources, flooding, and saline intrusion. Funded by the Dutch government, the project will run between 2019-2021. Its Vietnamese participants are the Hanoi University of Natural Resources and Environment, Thuyloi University, and the Institute of Natural Resources and Environment Training. Participants from the Netherlands include the Delft University of Technology, the University of Twente, and Utrecht University. The project revolves around tertiary and higher education on climate change adaptation and water resources management, with a focus on practical skills, internships, career orientation, and personnel capacity building. It will increase the quantity and quality of students studying in the water resources sector and ensure their future employment. Speaking at the launching ceremony, Deputy Minister of Natural Resources and Environment Vo Tuan Nhan praised the collaboration of participating universities. He noted that education plays an important role in forming a high-quality workforce on sustainable water resources management, who are capable of dealing with challenges facing Vietnam in the current context. 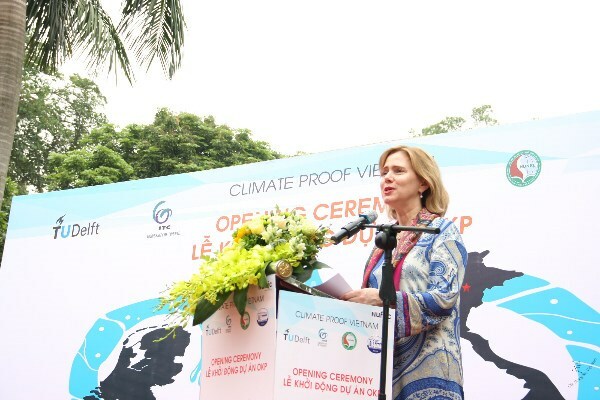 Dutch Minister of Infrastructure and Water Management Cora van Nieuwenhuizen said Vietnam and the Netherlands have to tackle similar challenges, in terms of climate change, urbanization, and industrialisation.